• There are 200 rooms and 37 suites. • Gan-Dan restaurant, the Garden restaurant and a breakfast room. • An outdoor pooll, a tennis court and a modern fitness center. • Hotel King David and it’s small beautiful parc are facing the legendary skyling of the old city of Jerusalem. • 1929: Palestine Hotels Ltd. purchased 4.5 acres (18,000 m2) on King David Street (formerly Julian’s way). The company is funded by wealthy Jews from Cairo, among them Ezra Mosseri, president of the National Bank of Egypt. They have the intention to add a Palace Hotel to the city of Jerusalem. • 1931: Opening of the King David Hotel designed by the Swiss architects Emile Vogt et J.P Hoffschmidt. The interior of the Hotel remembers the glorious times of King David. • 1946 July 22: Anti-british terrorist attack on the Hotel. 91 people die, one angle of the Hotel is destroyed. Even though the British officier Sir John Shaw was informed in time he gave the order not evacute the Hotel. As a result of the attack warning, reporters were already at the Hotel when the bomb exploded. • 1948 May 14: Declaration of the State of Israel. The Independance is proclaimed by David Ben Gurion. 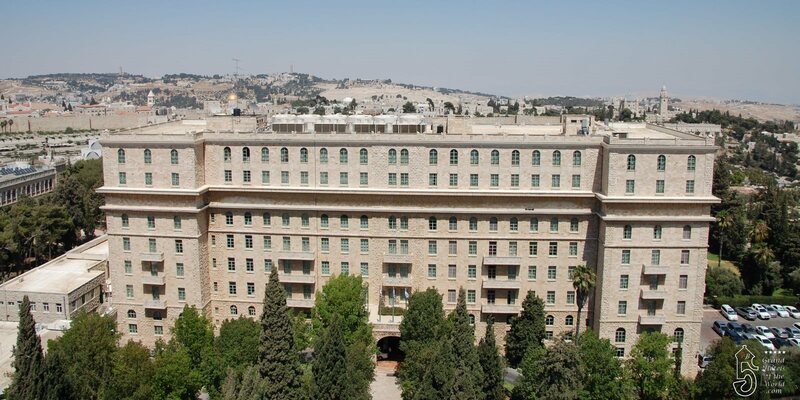 The King David Hotel plays an important role in the history of the state of Israel. • 1958: Acquisition of the King David by the Dan Hotels chain, owned by the Federmann family. Reconstruction of the destroyed Hotel angle. • 1960: Shooting of the film Exodus by Otto Preminger. The film is based on events that happened in 1947/1948 in relation to the founding of the State of Israel and the events that happened on the ship Exodus. The actors were Paul Newman, Eva Marie Saint, Peter Lawford, Ralph Richardson, Lee Cobb, John Derek, Sal Mineo and Jill Haworth. • 1975 August 29: Elisabeth Taylor and her husband Richard Burton stay at the King David. • 1977: Anouar el-Sadate, president of Egypt, resides at the Hotel during the Israelo/Egyptian treaty negociations.